The Atomic Badger: What does “advanced” nuclear power in the proposed legislation mean? What does “advanced” nuclear power in the proposed legislation mean? “Advanced nuclear energy” in the proposed legislation refers to “Generation III+,” “Generation IV,” and future potential nuclear reactors using a reactor design or amended reactor design approved after December 31, 2010, by the U.S. Nuclear Regulatory Commission (“NRC”). The date was selected to capture the benefits of NRC reviews following the Fukushima incident. Nuclear energy is a young, fast-evolving energy technology; it is less than 75 years since the first human-controlled sustained reaction was engineered in a former squash court at the University of Chicago in 1942. 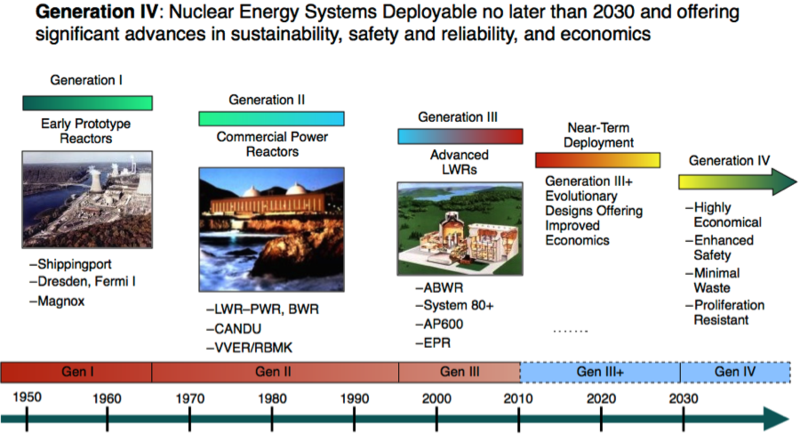 This graphic from the Department of Energy summarizes the history of, and current advances being made in, nuclear power technology. Most reactors now operating across the United States were commissioned in the 1970’s and 1980’s. These are “Generation II” reactors. Generation III+ reactors are the current state-of-the-art of reactors approved for use in the United States. Generation III+ reactors meet strict safety criteria. Regulators describe the Generation III+ AP-1000 reactor design, under construction at four U.S. locations, as “advanced passive.” This reflects that the reactor is designed to respond to extreme conditions, such as those that developed at Fukushima, by shutting down and cooling down by relying on the laws of physics. Natural conditions and processes, such as gravity and convection provide an extra level of protection, increasing safety by an order of magnitude. Four of these reactors are now under construction in the United States. Advanced safety features are incorporated into all Generation III+ reactors. More than 60 Generation III+ and Generation IV reactors, of various designs, are now under construction across the world. 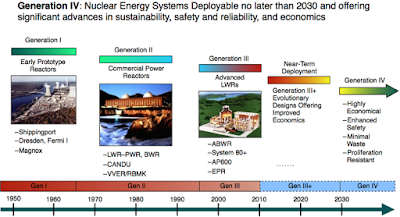 Another development in Generation III+ nuclear energy involves modular reactors. These are smaller reactors, designed so that major components can be built in factories and shipped to sites. They are being developed in order to lower capital investment, increase efficiency, and give U.S. Companies access to another energy niche in the world market. This research paper describes how one of these reactors anticipates complementing intermittent renewable resources, such as wind and solar, by supplying emissions-free electricity when the wind and sun are not available. Beyond Generation III+ innovations, Generation IV reactors, are being developed and commercialized now. Generation IV reactors aim to “close the fuel cycle” by converting today’s nuclear waste into tomorrow’s electricity. Based on successful demonstrations from earlier US research, optimism abounds. Established nuclear Companies, start-up companies, and well-supported ventures such as Bill Gates’ TerraPower are all involved in developing new reactor designs, and the general effort is supported by an organized international research and development effort.